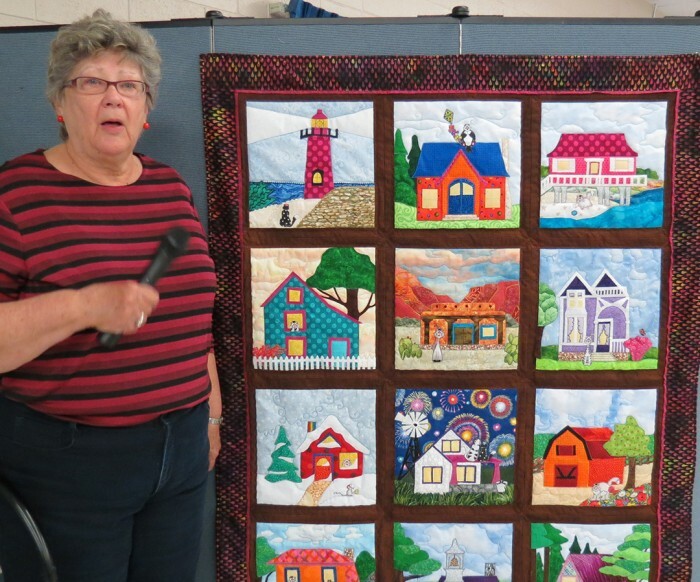 I love being a part of my local quilt scene. 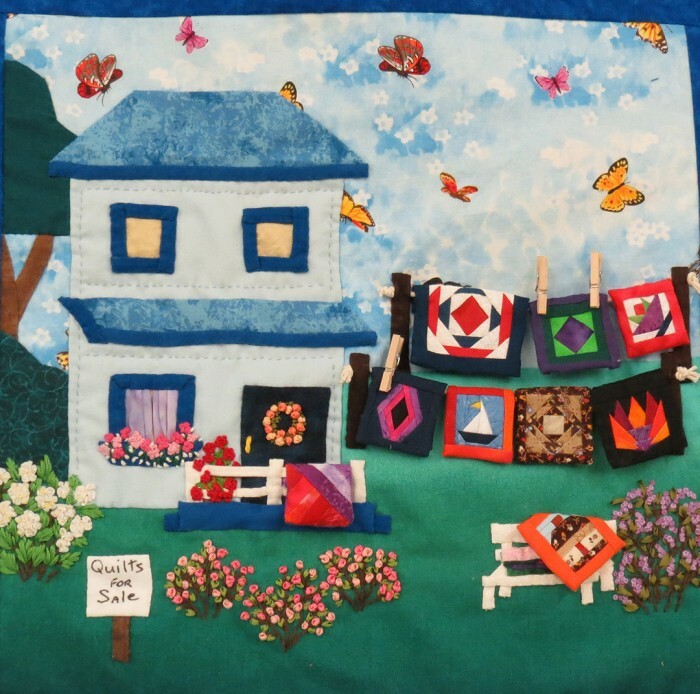 That includes two different quilt guilds, the New Mexico Quilter’s Association and Thimbleweeds Quilters of Rio Rancho, which is where my home is located. Perhaps because of my proximity to Thimbleweeds (2 miles away) or my relationship to my longtime friend, Donna Barnitz, who is one of their founders, this small group holds a very special place in my heart. 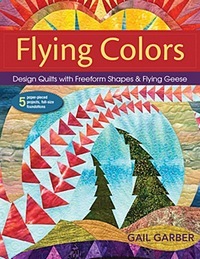 A long time ago, about 15 years or more, I used to publish quilting patterns. 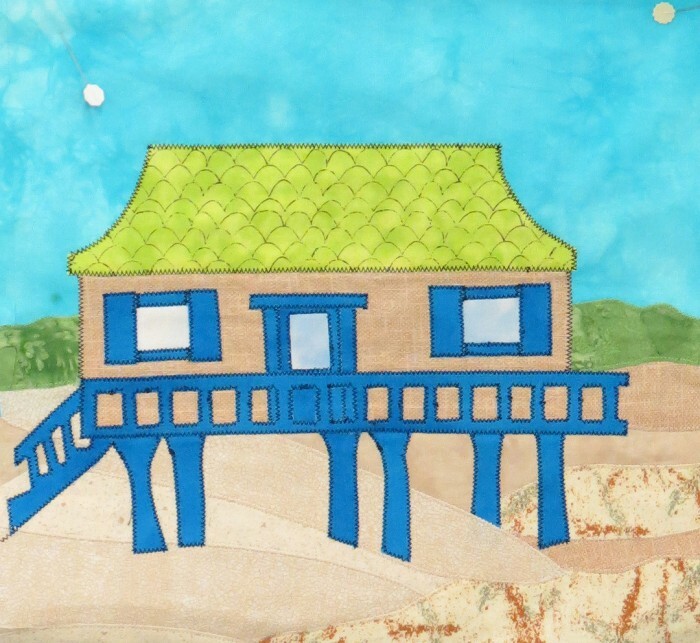 At that time, I was known for my applique designs. 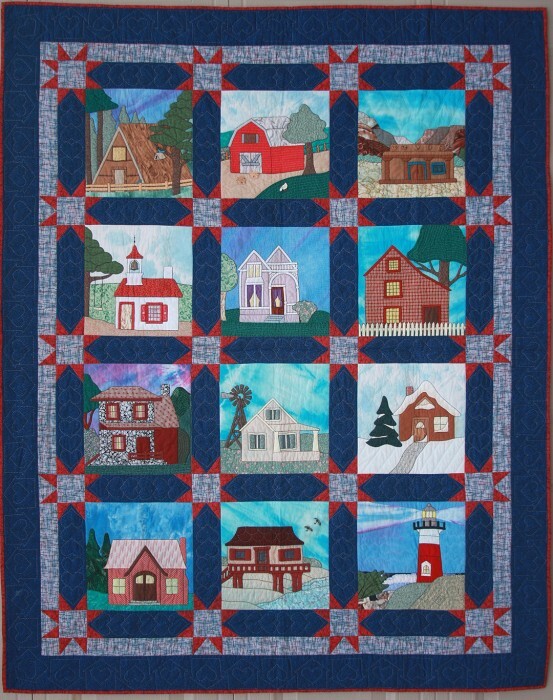 One of those patterns was called Homecoming and featured 12 blocks with houses that might be found anywhere in the U.S. I got out of the pattern business not long after this one was published. It was a lot of work and I wanted to be free from pattern-making to pursue new interests. 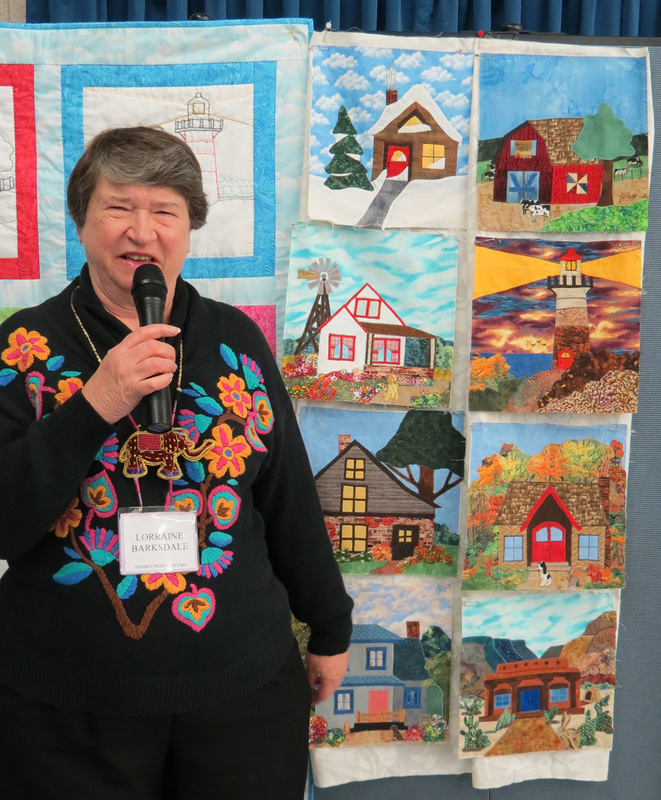 Homecoming was one of the last patterns that I produced for the general quilting marketplace. A while back, when I was cleaning out my garage, I came across boxes, many of them, all containing the parts to this pattern. Two choices confronted me: 1) throw them into the recycle bin, or 2) find a good home for them. Donna volunteered to take them off my hands and drove away with her newly discovered treasure. Fast forward to 2014 when my phone rang a couple of weeks ago and Ann Driscoll asked if I would like to attend their April meeting. They had a project to show me. Wow! They outdid themselves in creativity! Check out the variations below. 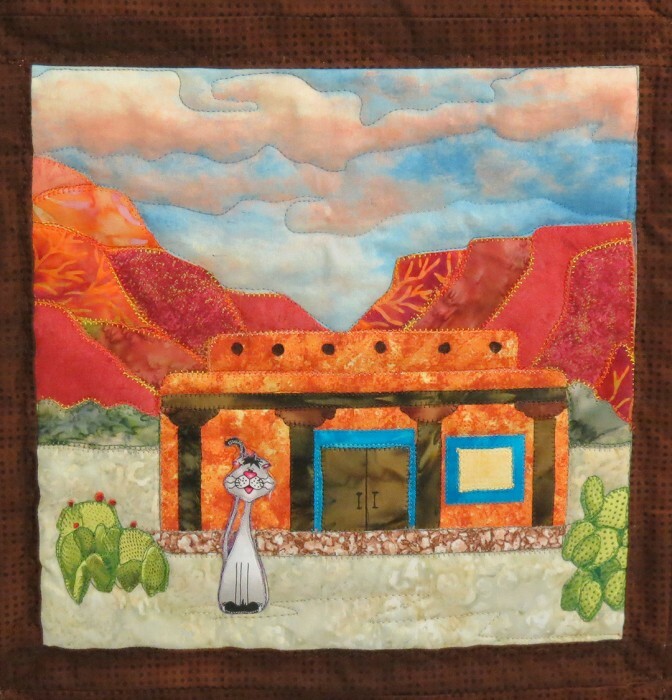 Lorraine created a unique feel to her blocks by adding southwestern embellishments. Check out the cactus and black-tailed jackrabbits, the desert cousin to the cottontail. 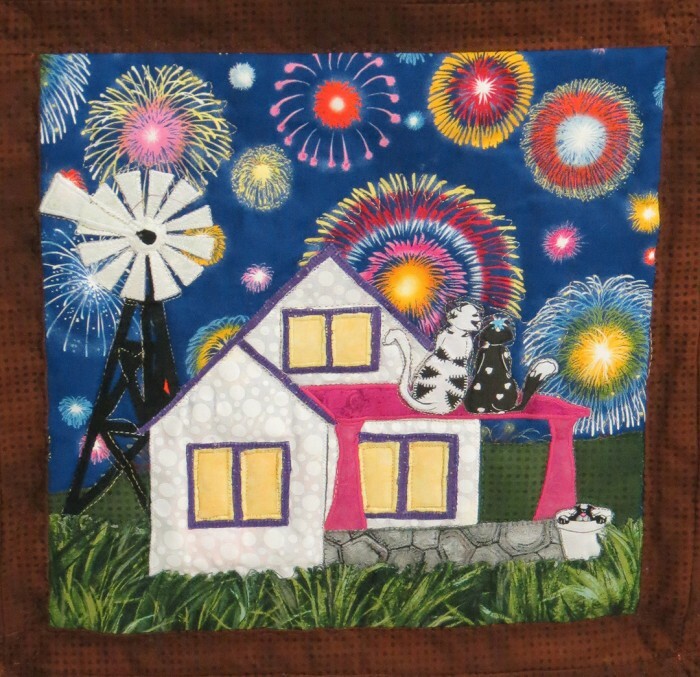 Colleen, head honcho of Thimbleweeds, is known for her beautiful hand-dyed fabrics. 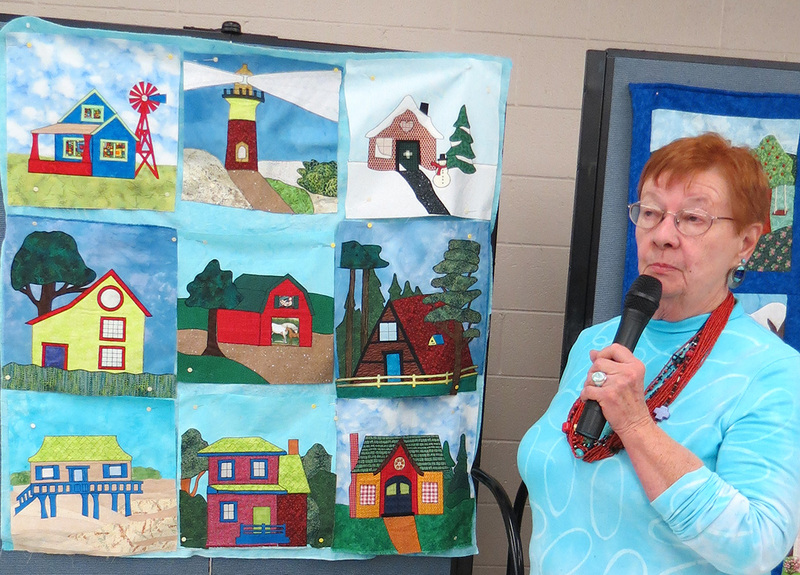 She opted to use only her own hand-dyes in this rendition. Mary Moya’s blocks stood out because of the bright colors she used. Mary loves bright yellow and lime green. 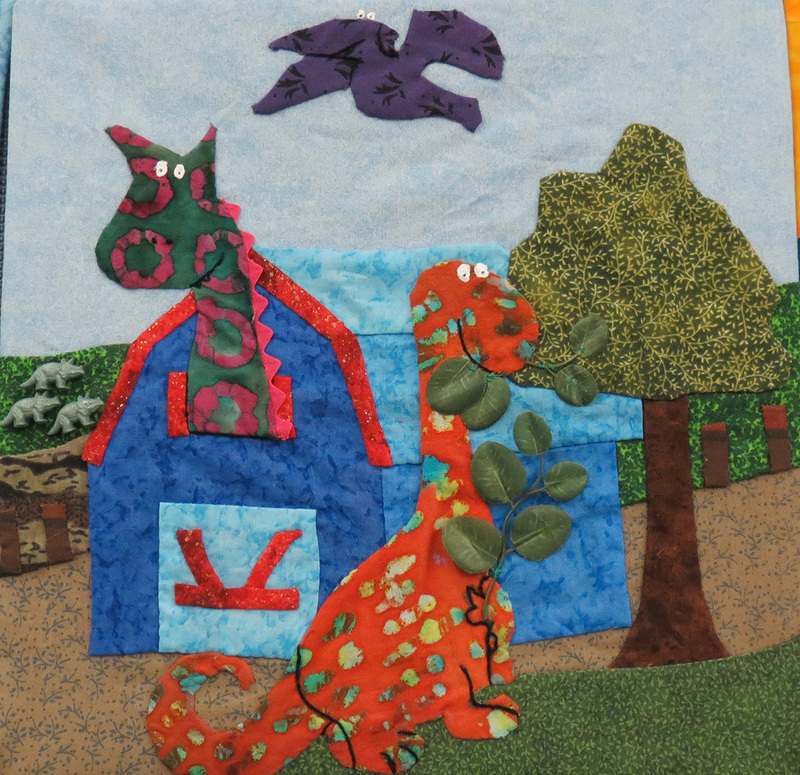 She opted to machine applique her blocks using a zig-zag stitch. 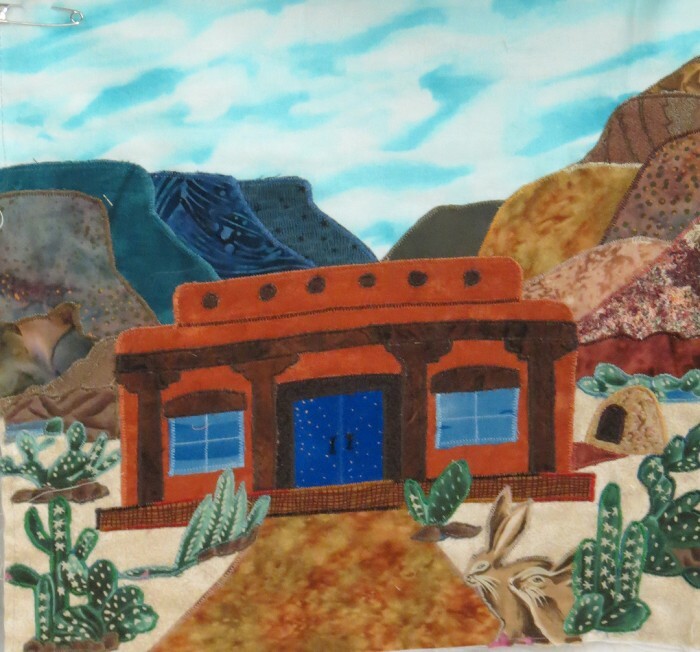 Ann Driscoll viewed the design as an embroidery project. 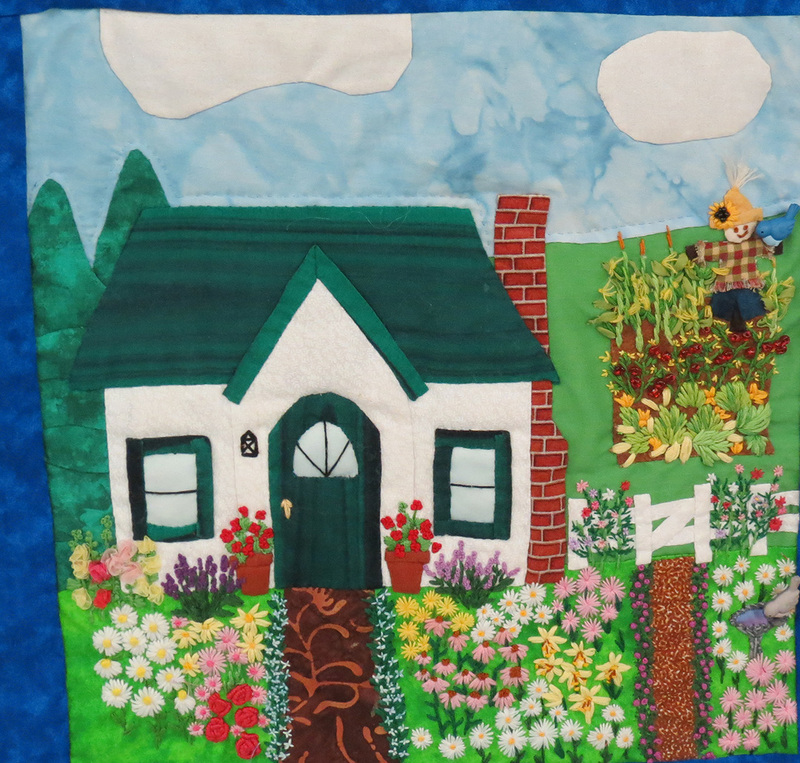 Each block was beautifully executed with floss and handwork. 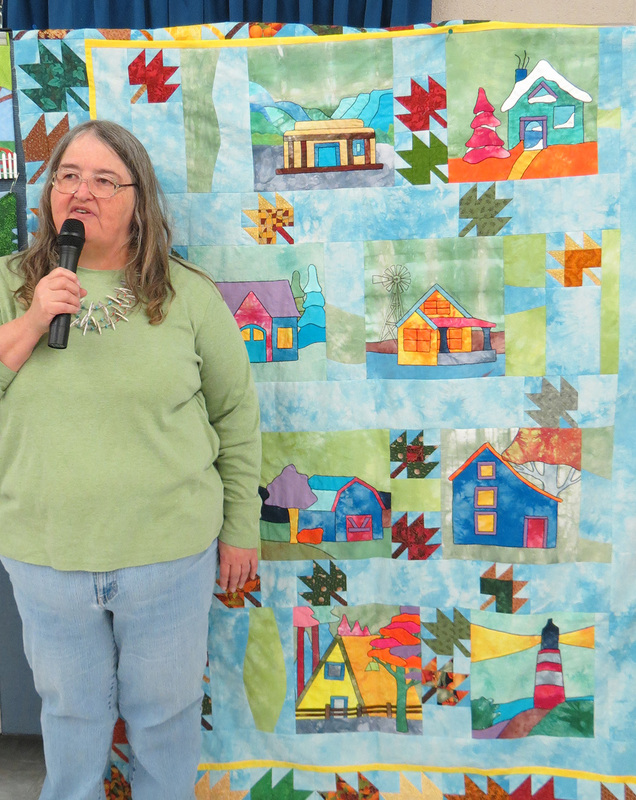 Check out the sashing on Anne Townsend’s quilt ! She told me that the block repeat in the border print didn’t quite fit, so she had to trim down the blocks to fit the sashing. Ardith added several unique touches to her quilt, both in embellishments and in fabric selection. The use of the fireworks fabric in this block literally makes it glow and reverberates with its Independence Day theme. Aridth also added a kitty to each of her blocks, a little surprise. But, surely one of the most elaborate quilts was the one made by Judy Aronow. 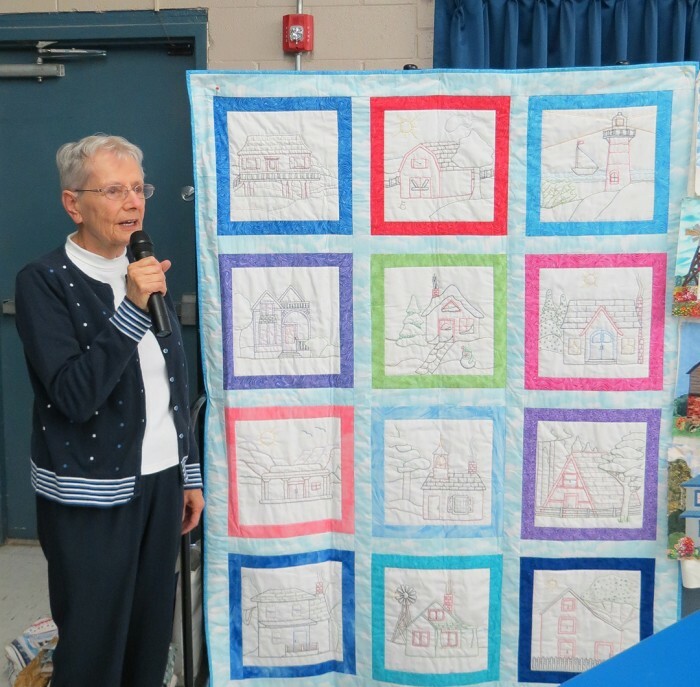 Hers was packed full of incredible ribbon embroidery and other goodies. Check out some of Judy’s blocks! It goes without saying that this block “Quilts for Sale” is far beyond what I had envisioned in my original pattern. And, then . 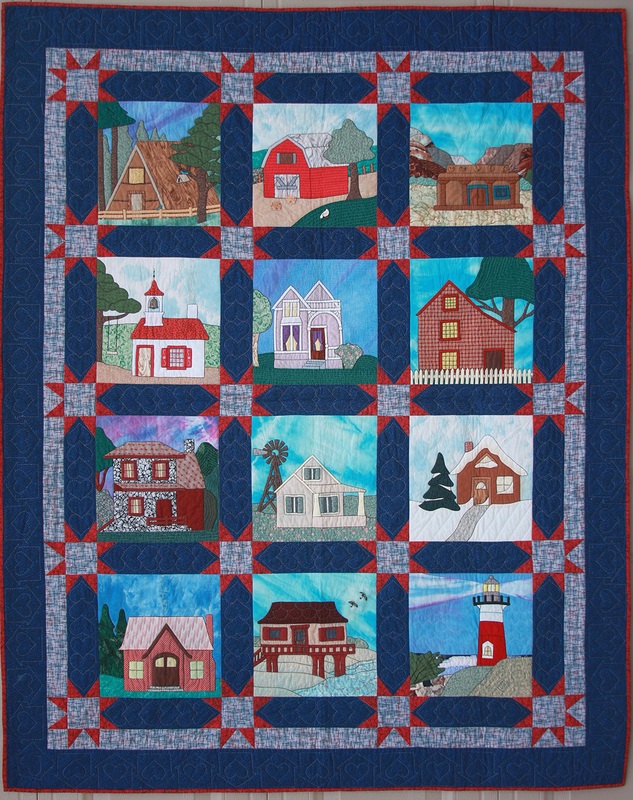 . .
at first, it might be easy to overlook these charming blocks by Holly Plugge, but look closely! Each and every block featured dinosaurs! How fun is that! 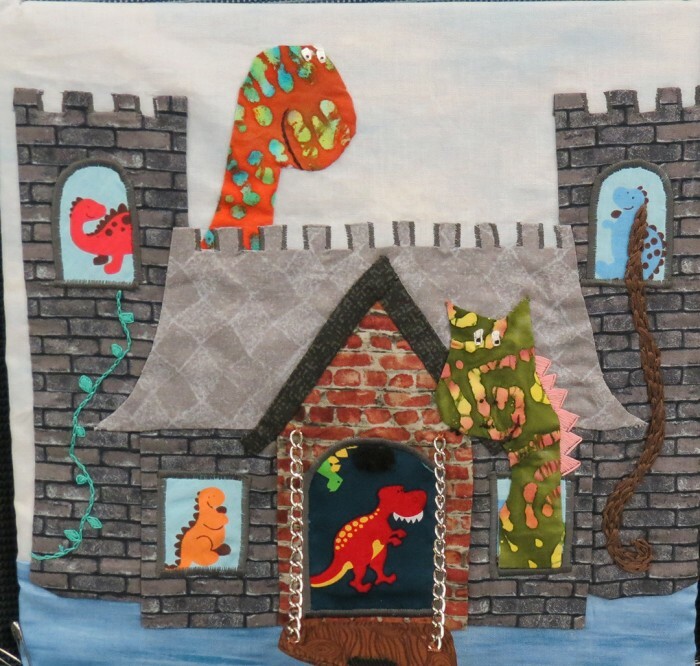 And the simple little house that I designed (the one that reminded me of the brick homes dominant in the area where I grew up – Cheyenne, WY) morphed into a castle, replete with dinosaurs! What a creative bunch of Thimleweeders! I never imagined all that they could do with one old pattern. But, it was not quite over yet! 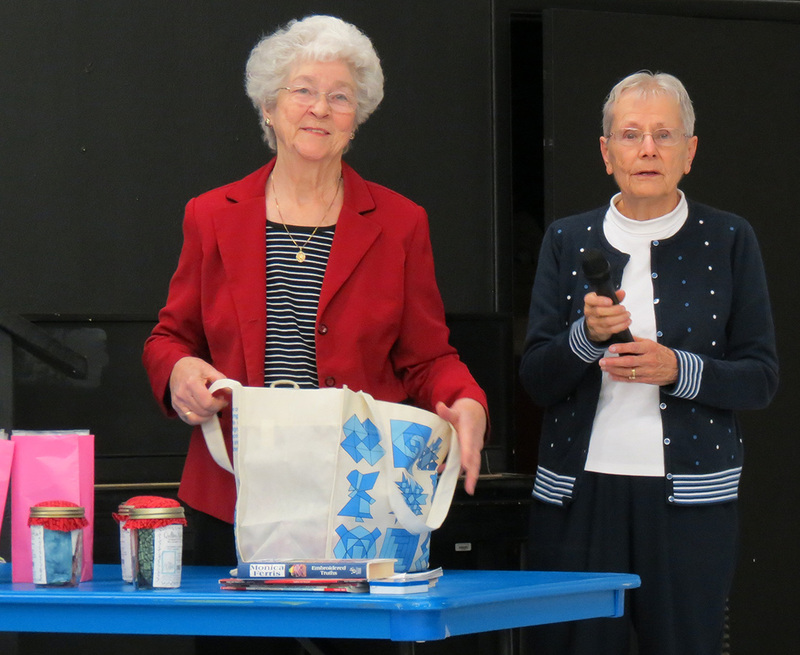 The two Ann(e)s had one more surprise in store for Thimbleweeds – Each participant won a prize for their creation. It was one of the most fun mornings I could imagine, far better than hanging out in the office! Great post! Donna shared your link via email and I posted it to the Tweeds FB page. What an awesome job ladies. They truly are lovely works of art! 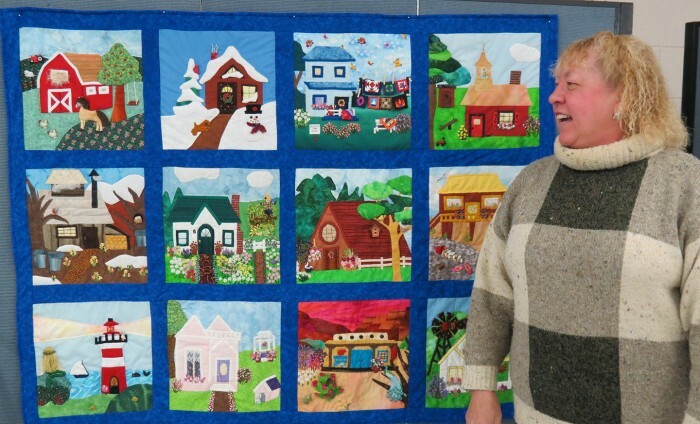 Thanks for sharing the patterns Gail. 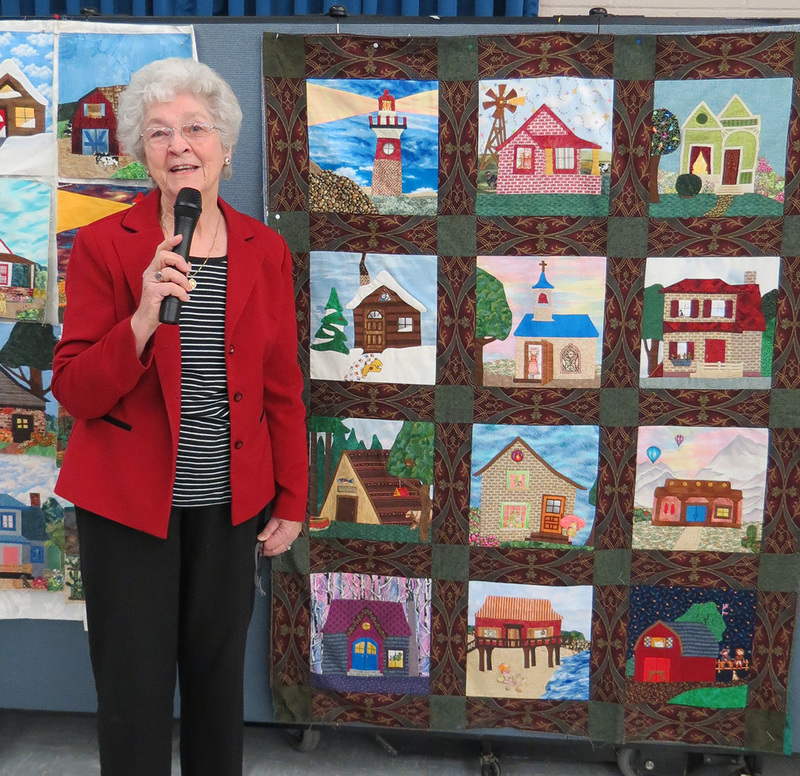 Thanks for showing all of these great quilts. I belonged to Thimbleweeds years ago, and still keep in touch with Donna and Colleen. 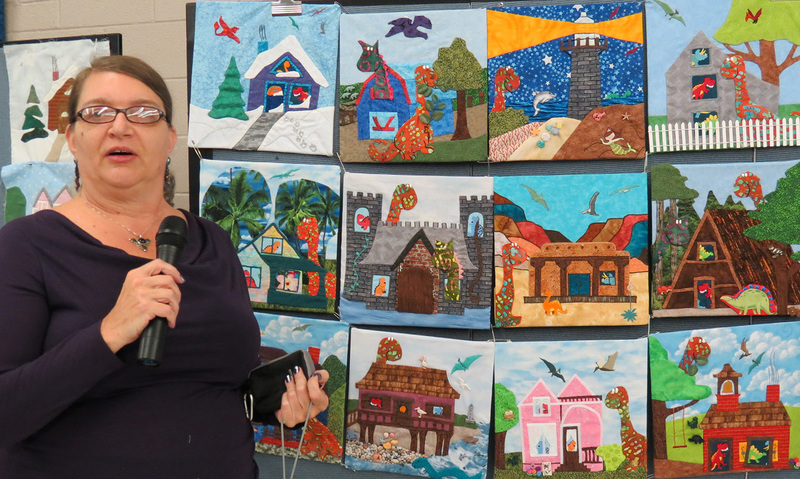 It was great to see these amazing blocks, but even better to see them with the quilters who made them. I haven’t seen some of them in ages, and it made me smile. I heard you speak when you were in Huntsville, AL last year. Wish I could have taken your class. I might just have to go back to knitting sox! Marvelous work, ladies.